The Rebel Sweetheart. : Foodie Goodie | Hawaiian Chicken. Thinking of what to serve your kids this weekend? Here's a sweet and tangy chicken dish that my four-year-old loves - aside from the usual fried chicken and his all-time favorite chicken curry. I'm pretty sure your little ones will enjoy this, too. 1. Rub chicken pieces with salt and pepper. 2. Place flour on a plate and coat the chicken on both sides with flour, pressing to make sure it adheres. Shake off excess flour. 3. In a large skillet, heat oil over medium-high heat. Once the oil is hot, add the chicken pieces to the skillet. Cook by batches to make sure that the skillet doesn't get too crowded. Add more oil if necessary. 4. Sauté chicken for 4 minutes,until it turns golden brown . Adjust the heat if needed. 5. Turn the cutlets and continue to sauté for an additional 2 to 3 minutes until chicken is brown on all sides and cooked throughout. Transfer the chicken pieces to a plate and set aside. 6. Next, make the sauce by adding the pineapple chunks (juice included), brown sugar, soy sauce, ginger, cloves, paprika and salt. Return the skillet to medium heat and stir for a minute. 7. Add the tablespoon of flour and continue to heat the sauce, stirring to collect any remaining juices and brown bits from pan, and allowing it to thicken slightly. 8. Pour the sauce over the chicken and serve with white rice. This both looks and sounds delicious. Loving pineapple always helps!! I loveeeee Hawaiian Chicken! That look so yummy and easy! Thanks for sharing it! This sounds yummerz! Will try it out soon! Thanks for sharing the recipe! Oooohhh my son loves chicken and he also loves pineapples. For sure, he would love this! 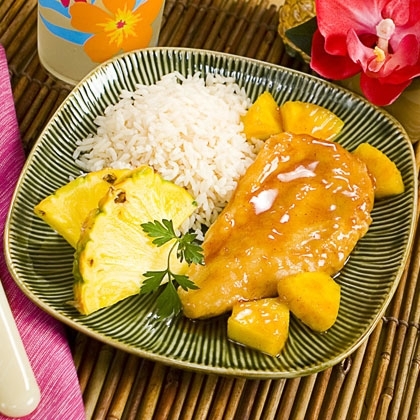 The chicken looks very rich in taste and has a nice complement with the pineapple. This looks yummy, I am sure my little boy will like this. I am writing the recipe and I hope I can cook this dish this weekend. Thanks for sharing! MY kids would love this! Thanks so much for linking up to Friday Food Frenzy!